If you follow me on Twitter, you may be aware that I’m currently following the Cambridge Weight Plan. I’ve been on it for almost 7 weeks and have lost just over 28lbs so far. It wouldn’t be everyone’s choice to lose weight so quickly in such an extreme way and indeed, I have my own reservations about the cosmetic side effects that such rapid weight-loss may leave behind. My biggest concern is keeping my body as toned as possible in an attempt to retain skin elasticity and firmness. I’m no expert in how to achieve this but anything that claims that it can help me has my full attention. I first came across Functionalab supplements in Harvey Nichols whilst I was having a look at some Nails Inc. polishes. The first thing that drew me to the brand was the packaging. Functionalab has curb appeal by the bucket load! The brand’s Beauty Doses are presented in rather cute Erlenmeyer Bulbs. Who knew laboratory glasswear could be so chic?! The whole look is minimalist and doesn’t strike me as the usual holistic supplement brand. I’m not only a supplement n00b, I’m also a skeptic. I’ve written before about how I’m loathe to pay money for supplements that claim to achieve nothing that good old-fashioned diet and exercise can achieve. “Yes, but they’re helping me do it in a quick, controlled way that I just can’t seem to achieve through normal healthy eating” would be my repsonse. Regardless, that eyebrow of hers would stay raised. I guess what I’m saying is… we’re all terribly tempted to take the path of least resistance through life. Whether or not we should is immaterial… if it’s available to us and we can afford to do it, I’m starting to realise that it’s perhaps better not to judge one another’s choices. So back to these Functionalab Beauty Doses… what are they and what do they claim to achieve? Functionalab asked me if I’d like to try their Body Toning supplement programme after hearing me fret on Twitter about whether I’d be able to buy pockets big enough to stuff my excess skin into once I’d finished with this diet. I was pleased to accept. I’m hoping that by taking these supplements in conjunction with my newly discovered hatred for jogging 3x a week, OCD body moisturising and general boring scrunches and toning exercises… I may get away with a pair of very tight ‘hold it all in pants’ once I reach goal weight. Here comes the tricky part though… how do I review? 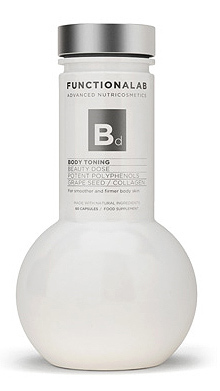 How do I judge whether or not the Functionalab Beauty Dose Body Toning supplements have actually done anything? It’s going to have to involve instinct and finding the answer to the age old question: Would I personally part with £32 a month until I’m through with this diet to continue on this course of supplements? 28lbs: sweet lord. aaaaaaaaaaaa That’s like unheard of and amazing. so so so so so so so so so so so so so so proud of you. Who cares whether it’s unhealthy. it’s not like you’re taking amphetamines, smoking, appetite suppressants or other diet pills is it. Be careful with this product! A girl we both know and love on twitter took some products from the line and developed a reaction from it: she actually put on weight from it and was bloated like a whale and it took for ever to subside. I’m in the same boat at the moment – currently doing weight watchers but weight is falling off me. Lost 2 stone in 8 weeks. Terrified of baggy skin. OCDing on the Nivea Q10 firming body moisturiser in the hope it does some sort of miraculous toning for me. Can’t wait to read your follow up post on this!